The Republican who won January’s Iowa Caucuses returned to the state this weekend to thank his supporters, tout his upcoming book, and put in a plug for John McCain — the GOP’s presumed presidential nominee. 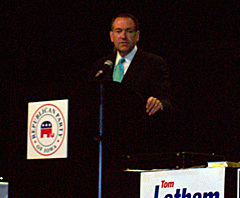 Former Arkansas Governor Mike Huckabee was the keynote speaker at the Iowa Republican Party’s state convention. "I am not insincere when I tell you it is great to be back in Iowa. I am so grateful for the opportunity to be here today," Huckabee began. "I have a book coming out in November that will talk about some of the experiences of the campaign. You will be happy to know the very first chapter is titled: I love Iowa." Huckabee began his argument for McCain’s candidacy by noting the historic nature of Barack Obama’s rise to be the presidential nominee for Democrats. "While I salute Senator Obama for his remarkable journey and believe that the journey itself has been good for this country, I would be the first to tell you he has gone far enough," Huckabee said. "And it has nothing to do with his color. It has to do with the convictions that he would bring to the highest office in the land." As for the second-highest office in the land, during an interview with Radio Iowa Huckabee seemed to suggest he’s not interested in going so far as to be McCain’s running mate. "I don’t expect to be asked. I really don’t. I mean, it’s pretty obvious if you look at what I’m doing — you know I’m not sitting around waiting on the phone to ring. Right now it would really mess up a whole lot of things I have going," Huckabee said, with a laugh. "So I’m clearly not living with any expectation that this is going to happen for me." Huckabee said his record had been thoroughly reviewed by reporters who covered his presidential campaign — and the McCain campaign has not asked him for the kind of personal background materials normally requested when someone’s being considered for the vice presidential slot. "If a person has been a candidate they have already been scrutinized," Huckabee said. "Most everything that somebody would want or need to know is in some public record somewhere." During his conversation with Radio Iowa, Huckabee suggested Republicans need to "get moving" and show more enthusiasm for McCain. "While you know a lot of people here would say, ‘Well, gee, McCain isn’t my first choice,’ he’s not my first choice either. I was my first choice, but I’m not on the ballot," Huckabee said. "There’s two people going to be on the ballot this year and one of them is a clear choice over the other one for me." Listen to Huckabee’s speech to the GOP convention by clicking on the audio link below. There is also a link to the opening portion of Radio Iowa’s interview with Huckabee below.